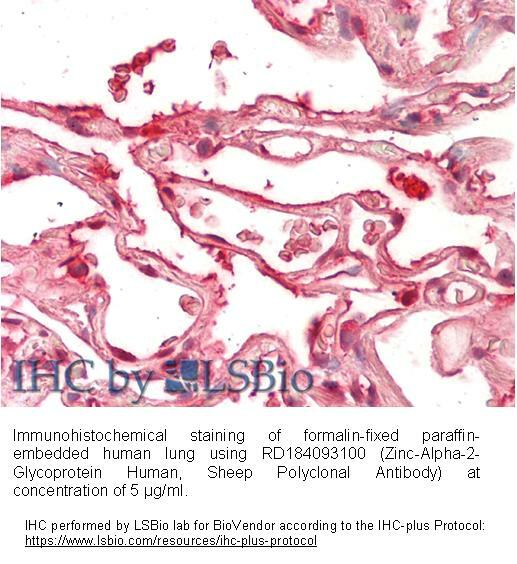 The antibody was raised in sheep by immunization with the recombinant Human ZA2G. The immunization antigen is a protein containing 290 AA of recombinant Human ZA2G. The AA sequence (AA 13–290) is identical to Swiss-Prot-P25311 (AA 18–295, mature Zinc-Alpha-2– Glycoprotein). 12 extra AA were fused with the N-terminus (highlighted). Immunoaffinity chromatography on a column with immobilized recombinant Human ZA2G. Zinc-alpha-2-glycoprotein (ZAG) is found in body fluids such as serum, sweat, and seminal and breast cyst fluids. It is identical in amino acid sequence to tumor-derived lipid mobilizing factor (LMF), a protein associated with the dramatic loss of adipose body stores in cancer cachexia, and has been shown to stimulate lipolysis by adipocytes in vivo and in vitro. A role for ZAG has been proposed in the regulation of body weight, and age-dependent changes in genetically influenced obesity, and also it regulates melanin production by normal and malignant melanocytes. It has also recently been classified as a novel adipokine in that it is produced by both white and brown fat adipocytes and may act in a local autocrine fashion in the reduction of adiposity in cachexia. Controlling ZAG/LMF's activity could be life-saving in the management of certain cancers and other cachexia-inducing conditions, and its possible normal role in body fat store homeostasis is deserving of understanding in its own right. 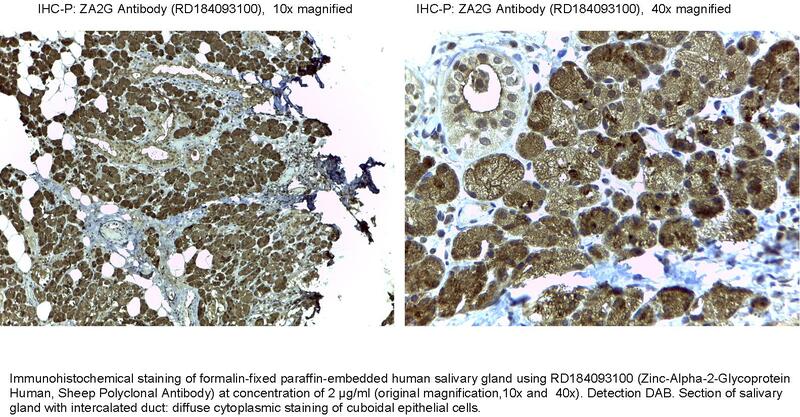 ZAG exhibits a class I major histocompatibility complex (MHC) fold but is a soluble protein rather than being anchored to plasma membranes and does not associate with alpha-2-microglobulin in humans. Like antigen-presenting MHC class I proteins, ZAG has an open apical groove, and X-ray crystallography of human-derived ZAG revealed an unidentifiable electron density in a similar position to that occupied by antigenic peptides in classical MHC proteins and glycolipids in isoforms of CD1. This presumptive ligand is not a peptide, and the groove is too small to hold a glycolipid such as is presented by CD1 isoforms. By analogy with all other MHC class I-related proteins that have an open apical groove [some do not ], occupancy by a ligand is probably crucial to ZAG's biological function. Despite all of the structural and biochemical evidence that ZAG binds a ligand, none has so far been found by extraction from protein isolated from biological fluids. This difficulty could be because the ligand is labile, heterogeneous, or readily lost during purification procedures. Knowing more about how ZAG interacts with the compounds it has been found to bind, both natural and artificial, will inform searches for the elusive ligand(s) and its/their role in ZAG's signaling function.